The Xerox Phaser 5500 drum cartridge yields up to 60,000 high-quality pages. 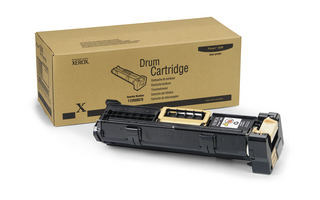 Because the drum cartridge is a separate unit from the toner cartridge, both cartridges may be used up completely, enabling overall supplies savings and less waste of unused portions. And, when you are finished with the drum cartridge, Xerox will recycle it for free through our Green World Alliance supplies recycling program. Xerox cartridges are easy to replace and are designed to interact perfectly with other Xerox supplies, ensuring superior print quality and reliability-leaving more time for carefree, unattended printing.